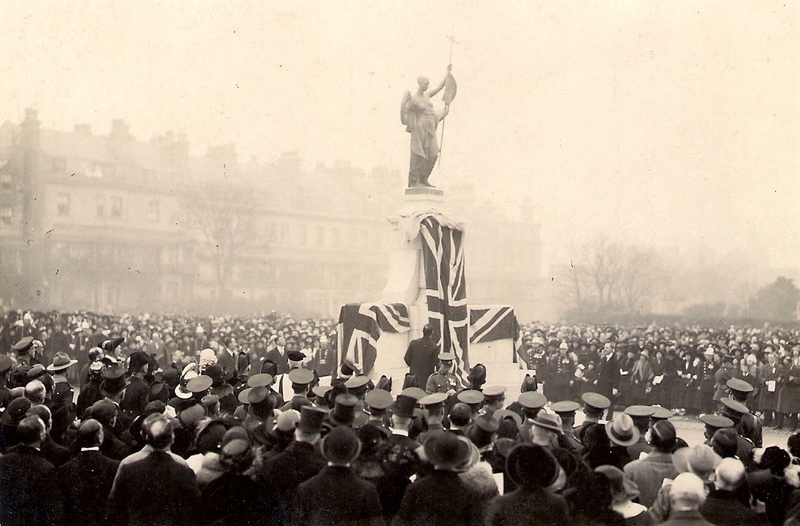 A large crowd of people congregated at the eastern end of the Leas, Folkestone on Saturday, 2nd December 1922 to see the unveiling of the War Memorial; fortunately it was a dry day with fine weather. An enclosure was provided at the eastern end of the memorial for all relatives of the 578 dead men who were to be commemorated and honoured that day. Members of the committee, subscribers and principal residents were in an area opposite with members of the British Legion and ex Service men next to them. The Folkestone Naval Cadets, Boy Scouts, Girl Guides and St Johns Ambulance lined the approach to the memorial in West Terrace. In front on the memorial itself, a guard of honour with the Regimental Colours from the 1st Oxford and Buckinghamshire Light Infantry were in position. Other services such as the Coastguard were also represented. Also a special enclosure housed two hundred children, who represented all the local elementary schools, under the leadership of Mr P. Greenstreet. The Mayor, Alderman E.J.Bishop, members of the Corporation and other Prominent people from the locality such as Rev. 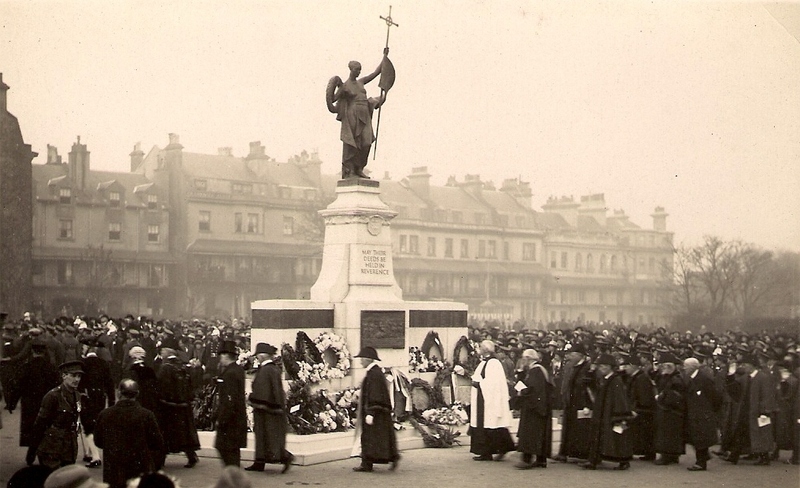 Canon Tindall (the Vicar), Col. W.J.Dugan C.M.G.,D.S.O (Commander of Shorncliffe Camp), The French, Belgian and Italian Vice-Consuls marched up to the War Memorial from the Town Hall. Then, Lord Radnor and Sir Stephen Penfold (Chairman of the War Memorial Committee) arrived and the ceremony began. The Vicar, Rev Canon Tindall, dedicated the memorial and led everyone in the Lord’s Prayer. The Guard of Honour presented Arms, the last Post played, and the Regimental Colours were dipped. Sir Stephen Penfold, then asked the Mayor to accept the memorial on behalf of the Town. He did this saying “I accept it on behalf of the Council of the Borough, who will, I am confident, preserve it with reverential care…. “The hymn, Abide with me, was sung, followed by the placing of a number of wreaths on the memorial. The National Anthem was sung and Benediction was pronounced. The “Reveille” rang out and with a march past of the dignitaries the ceremony was completed. Then relatives of the men who died came forward and placed there own floral tributes around the memorial. The following links contain the list of the fallen as printed by the Folkestone Express in 1922.